developed by Col. Watanabe Wataru, deputy chief of the Japanese military administration in Malaya. An ominous yet mystical symbol of military occupation, juxtaposed against Anglo-Saxon finery in a contrapuntal fugue of endless variety of colour and texture, sometimes consonant, sometimes dissonant. It traveled far and wide, being given a place behind post office counters across much of the peninsula and even in large parts of the former Netherlands East Indies. 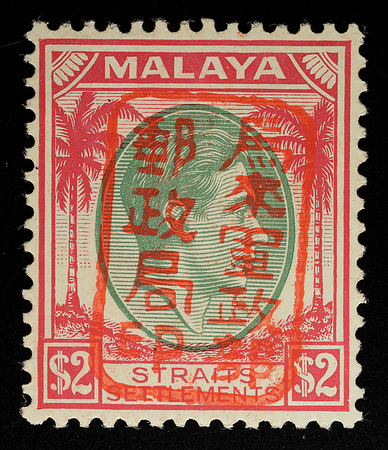 The iconic Gunsei-bu single-frame overprint, sometimes called ‘Chop ii' by the overprint junkies (of whom the author is one), reads ‘Malaya Military Government Division Postal Services Bureau Seal'. To meet demand, nine steel chops were engraved by hand, and they were slightly different from one another. Not all of them were used on the coconut definitives (Proud & Rowell 1992). The Heiti (sans-serif) script would have been relatively easy and quick to engrave. Nine aren't that many—there were 21 types of Pakistan's handstamped Lahore SERVICE overprints (Mike Roberts comm.). Nevertheless they embodied the traditional east Asian signature, which was recorded in Japan as early as ad 57. 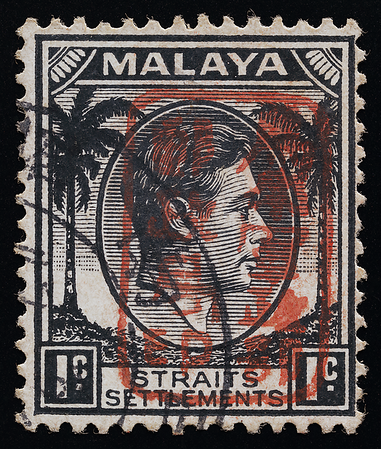 The earliest single-frame overprints were produced in Kuala Lumpur from early April 1942 in several shades of violet ink, followed by red, brown and black ink in that order (Coulter 1966). 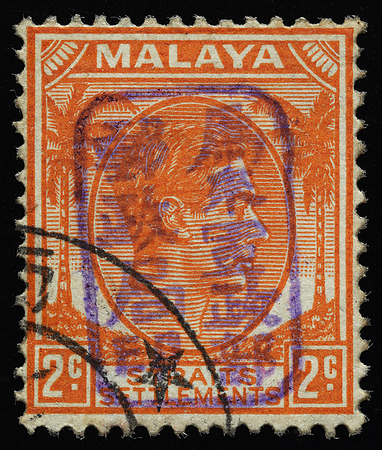 Interestingly, violet overprints rare on the coconut definitive, red being the commonest, while violet is common on some other definitive designs. 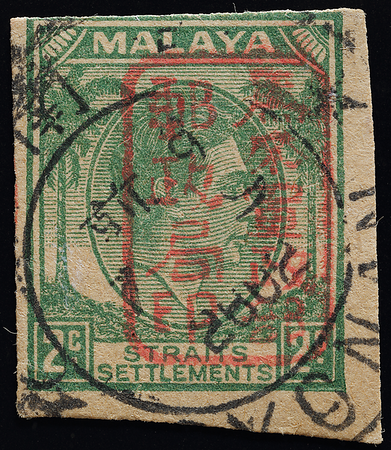 This suggests that coconut definitives weren't first in the queue for the single-frame overprint. The choice of violet ink was thought to have stemmed from its customary use in the accounts office at the time (Coulter 1966). The brown ink was due to sedimentation (Proud & Rowell 1992), and many intermediate shades of the four main colours exist (Gallatly 1962d, Coulter 1966, Proud & Rowell 1992). See Coulter (1966) for a detailed historical account, and Gallatly (1959a, 1962d) and Proud & Rowell (1992) for identification keys to the seal types. 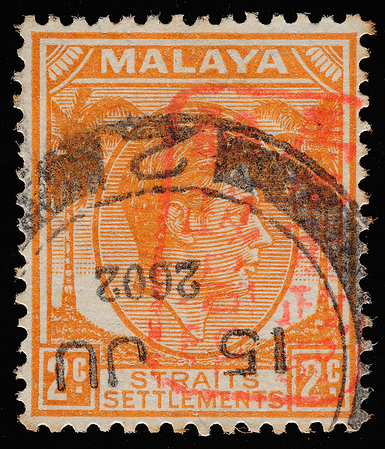 Overprinting works were subsequently established in Singapore; there remains considerable confusion as to the timings and locations of seals and colours (Coulter 1966); see McEwen (2013) for details. 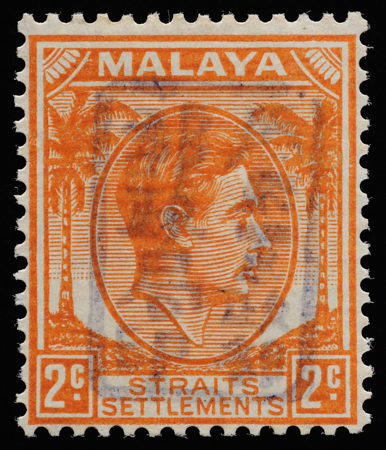 The authorities in Singapore and Kuala Lumpur initially allowed individuals to bring in stamps purchased before the occupation to be overprinted at a charge equivalent to the face values of the stamps. Philatelists exploited this opportunity to proliferate a bewildering variety of colours and values (Dewey 1959b, Proud & Rowell 1992 p. 270). Furthermore, entire sheets were reportedly overprinted, some inverted, for presentation to Field Marshal Hisaichi Terauchi, commander of the Southern Expeditionary Force that had been tasked with the conquest of southeast Asia (Coulter 1966). Ironically, intense acrimony simmered between Terauchi and the man who conquered Malaya, Lieutenant-General Tomoyuki Yamashita (Swinson 1969). Yamashita wrote in his diary as he closed in on Singapore in January 1942: "I can't rely on communications with Terauchi and Southern Army, or on air support from them. It is bad that Japan has no one in high places that can be relied upon…That bloody Terauchi! He's living in luxury in Saigon with a comfortable bed, good food and playing Japanese chess." There were genuine overprint errors too. 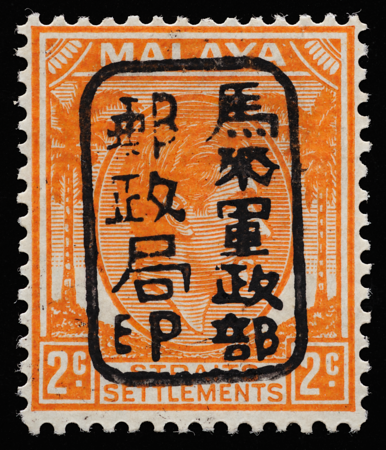 Douglass [sic] Ross, a postal clerk in Singapore, overprinted half a sheet of the 10c upside down, being clueless about the Kanji script. Fearing reprisal from his Japanese superiors, he despatched the sheet as far away as possible. 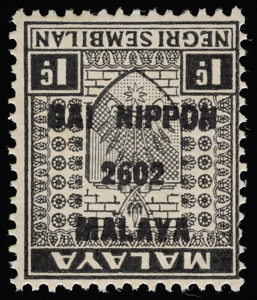 The stamps found themselves in northeastern Sumatra (Ricardo 1963), among the batches of Japanese-overprinted Malayan stamps issued in parts of the Netherlands East Indies. Type 1 of the seal (Proud & Rowell 1992). 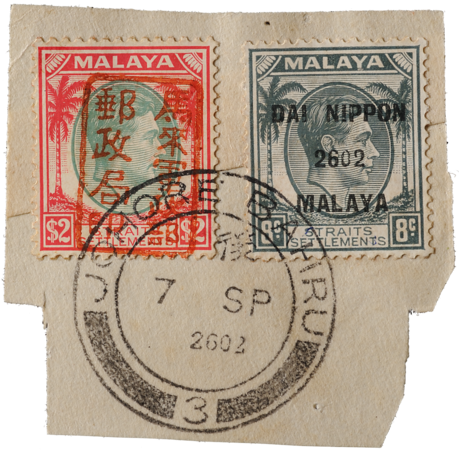 Left, date slug of pre-war datestamp altered to Japanese year; right, Japanese-made datestamp with Singapore's new name Syonan(-to), "Light of the South". Two greens and two reds: the rare combination of the single-frame overprint (Proud Type 2, Gallatly Type B) on the prestigious $5 was for fiscal use only. Before the war, the $1, $2 and $5 (the largest denomination) had chiefly been for air mail. Stamps bearing early Japanese overprints have a captivating improvisatory disposition, owing to the stopgap measure of painstakingly applying handmade overprints to individual stamps by hand when the postal system was still reeling from the Japanese invasion. Proud Type 3 (Gallatly Type H), less often seen on the coconut definitive than the previous two types. 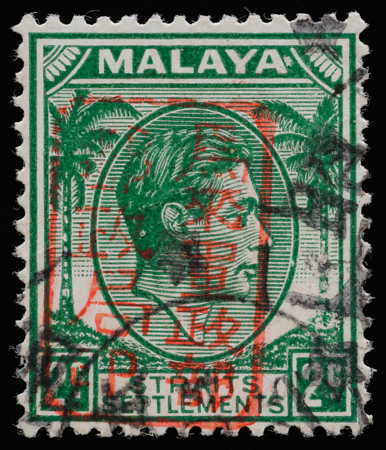 The overprinted 2¢ green is one of the rarest, since most 2¢ stamps in stock were in orange ink by the time the Japanese arrived. Another near-mythical number is the 40¢ with a brown chop. Both Proud Type 3 (Gallatly Type H). 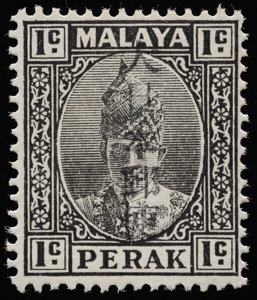 A rare variety, the Gallatly type A in black ink on the 1c. Type A is characterized by a heavy, sturdy frame, and the characters are often heavy in typographic weight as well. Black-on-black is decidedly hard to read and rarely encountered in the postage stamps of the world. There was little concern as to colour contrast between stamp and overprint, since the priority was to deface the king's portrait (Coulter 1965). Aesthetically, it radiates an aura of purity and severity not attained by coloured mixes, juxtaposing the dissonant splendours of European and Far Eastern hand engravings like a modernist drawing. 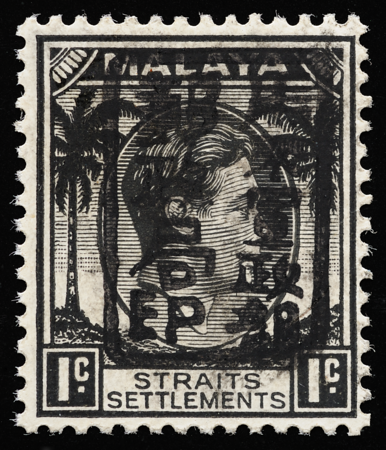 It is all the more special because it is the only instance of a black overprint on a black coconut definitive; no other overprint appears in black on the 1 cent coconut. Other instances of black on black in the Japanese occupation of Malaya. On the left are quadrilateral and elliptical geometries juxtaposed like the above, while on the right we see a preponderance of neatly spaced orthogonal (right-angled) elements and a face-off between two MALAYAs (Japanese versus British). 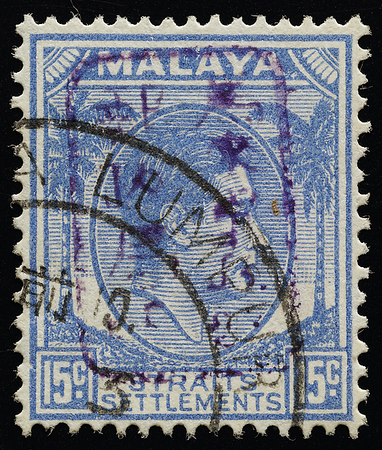 Gallatly Type D, an extremely rare type on the coconut definitive, in a funky "electrocuted" look of violet on blue. The blotchy print was probably caused by partial drying and uneven accumulation of ink on the chop. The rough-surfaced paper used for this denomination may have been a contributing factor. This stamp was authenticated by the British Philatelic Association in 1997. 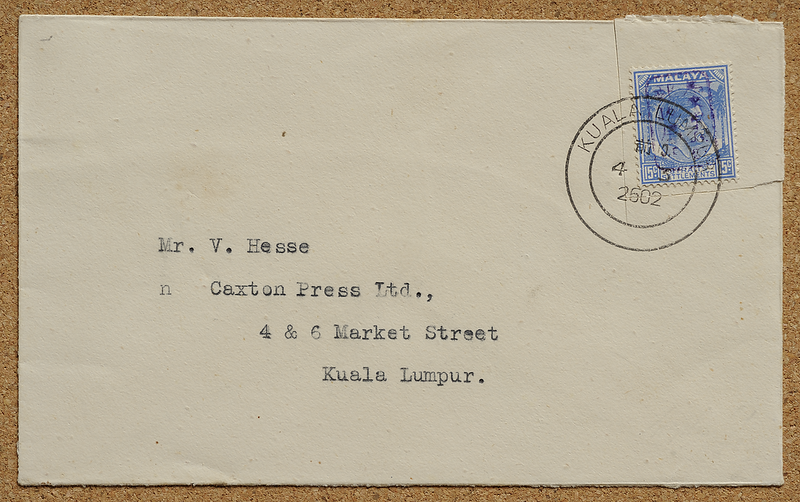 The author has seen another 15 cents with a similar-looking overprint of Gallatly type H, also certified by the BPA. A reconstruction of the 1942 cover from which the stamp was snipped out and soaked off by its previous owner. 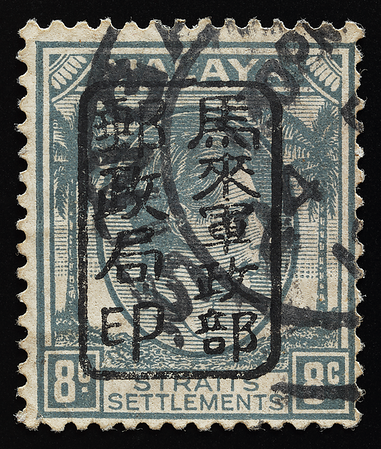 Japanese occupation overprints are notorious for forgeries (Rowell 1972). 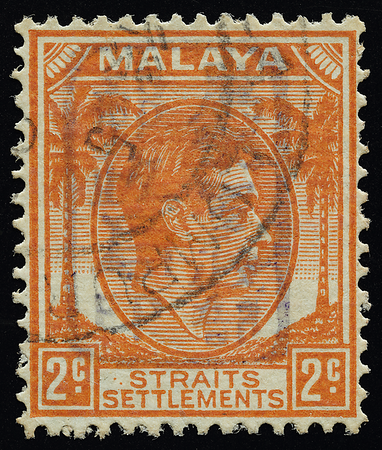 By 1966, more than 50 forgeries of the single-frame overprint were known, including some good ones made in Malaya and a few on cheap stamps probably to foster confidence (Gallatly 1959a, Coulter 1966). The proliferation of these forgeries was aided by the enormous variability and inconsistency of the real overprints themselves providing the necessary camouflage under which fakes readily infiltrated. Gallatly (1962d) illustrates some of these. Even genuine examples of a single type of the single-frame overprint are highly variable because of the inconsistency of ink consistency. Indeed, Gallatly (1962d) recorded a forgery that actually went through the post during the occupation itself, and more forgeries appeared almost as soon as the war was over (Cheah 2007). I have even heard rumours that some of the overprint handstamps still exist, but has not been presented with any evidence. Today forgeries probably outnumber genuine overprints, contaminating history like radioactive isotopes in a Chernobyl disaster zone. Nevertheless Lin (2016) presents arguments for the collection and study of forgeries. Coulter (1966) mentions the existence of a full set of genuine impressions of the 'nine universally accepted single-frame types' in the 'possession of a well-known Japanese philatelist' that serves as an unparalleled 'reference piece for classifying and authenticating die types'. This 'proof sheet' is reproduced in colour in Proud & Rowell (1992). A relatively sophisticated forgery of Proud Type 2 (Gallatly type B) with a most likely forged signature of Milo Rowell. The characters are problematic and the ink is crimson instead of scarlet. 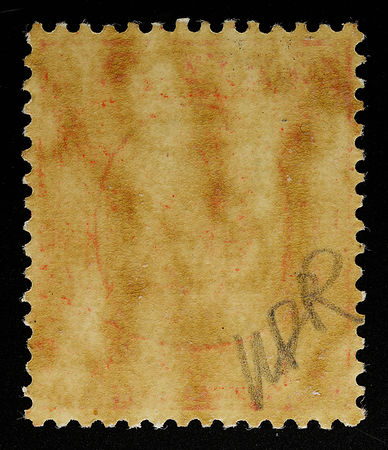 A forgery of Proud Type 2 (Gallatly type B) and possibly the rare sedimented brown ink, paired with a forgery of one of the most widely forged postmarks—Syonan. 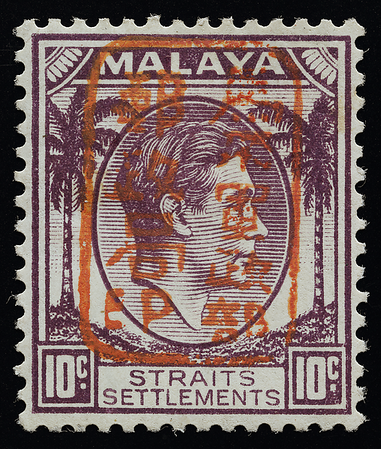 Nicknamed by the author for the delicately chargrilled appearance and the scarcity of the real versions, these stamps carry Gallatly type H (left) and type A in violet ink, a rare overprint colour on the coconut definitive. I have seen a couple of other copies of ghostly type A's circulating in the philatelic market, but this observation does not confirm whether the overprints are real or fake. The similarity in ink on the two examples above suggests that one outfit fabricated fairly realistic forgeries of two types of the seal, which seems more effort than is necessary to make money. Coulter (1966) gives an overview of forgeries of the single-frame overprint, although detailed analyses of individual forgeries are not provided. One of the famous forgeries was made in the 1960s by George Gee (Wells 2005, 2006) using counterfeit blocks most closely resembling Proud Type 5 (Gallatly Type E). Most of the differences are very subtle and reveal themselves only on scrupulous observation. Once familiar, however, one can tell at a glance that there is something fishy, given especially the crisp jet-black impression. This forgery of Proud Type 5, here faking the even rarer sedimented brown ink, is listed by the B.P.A. Expert Committee (1959) as Forgery 12, among the more than 40 forgeries of the single-frame overprint that they had documented at the time. Some of these were thought to have been made in England. 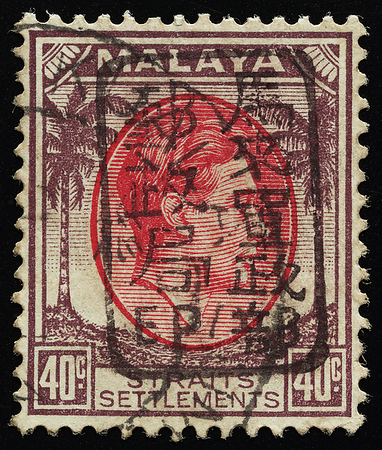 The 'Ceylon Forgery', listed as Forgery 2 by the B.P.A. Expert Committee (1959), is said to be an early forgery originating from India (Coulter 1966). 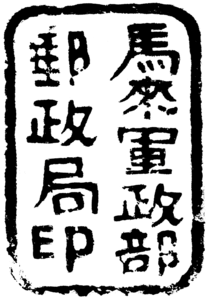 The seal is distinguished by a mysterious phantom curved stroke between the character at bottom left and the character above it. Some purport that this was in fact a legitimate 'tenth' type of the seal, much like a philatelic incarnation of Beethoven's hypothesized Tenth Symphony. 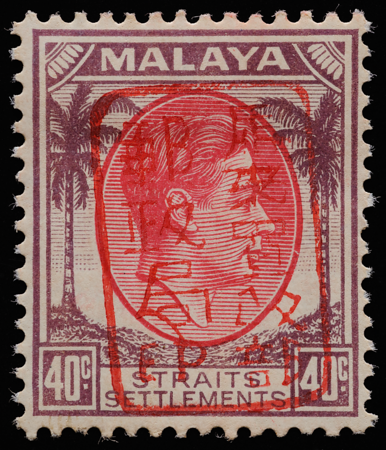 It has been claimed that stamps bearing this seal were prepared for use but unissued and eventually sold philatelically at the Nassim Road Post Office in Singapore (Coulter 1966). But I think this is unlikely; the extra stroke simply doesn't exist in the language, the character to its right is grossly disfigured and the overall typographical crudeness resembles that of other forgeries. Unlike Gee's professional releases, this is one of the 'prosumer-grade' products in which many of the Kanji character shapes deviate from any of the nine known types of the seal. A genuine overprint (right) tied with a forged postmark act as decoys. One sees on closer inspection that the frame and characters are sharply and continuously bordered throughout with a very fine but distinct outline. This feature is uncharacteristic and may have been the result of the precision of modern methods used to fabricate the fake seal. In this respect George Gee was more faithful to the original character of the seals. Nevertheless, the present forgery beats those made with crude rubber stamps that produce indistinct characters. The material here appears to be harder, possibly even one of those popular homemade photopolymer stamps cheaply and easily hardened by ultraviolet curing in any desired pattern. The process of ultraviolet hardening of the pattern and subsequent rinsing away of excess unhardened polymer could have produced the incisive outlines seen here. 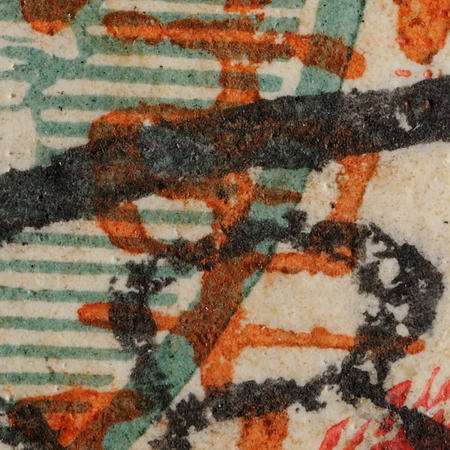 Close-up of the above showing the uncharacteristically brittle texture of both overprint and postmark. A crude forgery using a hard die, on which the frame has obviously been carved with the help of a straight edge. Efforts to impart a calligraphic slant to the characters only give away the forgery. Gallatly (1959b) gives further examples of forgeries of the single- and double-frame overprint with neat, straight-edged frames and clean characters. This counterfeit is different from those described so far. It appears to have been made with a rubber stamp. The strokes are thicker and the ink boundaries less crisp. The characters also exhibit typographic traits of the slightly calligraphic kaishu script, a qualitative deviation from the predominantly heiti script of the real overprint. The person who made the chop was too artistic or tried too hard to make it nice. 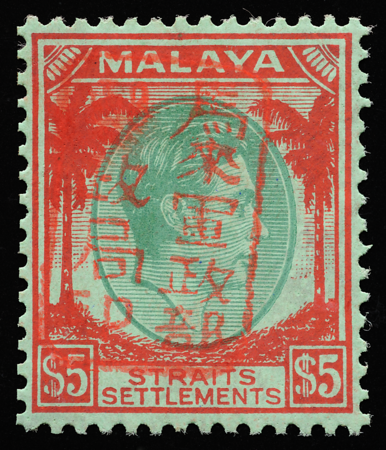 Contrary to popular sentiment, the author argues that handcarved Malaya Japanese occupation overprints are actually forge-resistant. The act of hand-engraving and handstamping the real seals gave them a uniqueness much like signatures or handwriting, making them difficult to replicate exactly. Just like a signature, it does not have to be a complicated design to be effective. Unfortunately, it can also backfire. 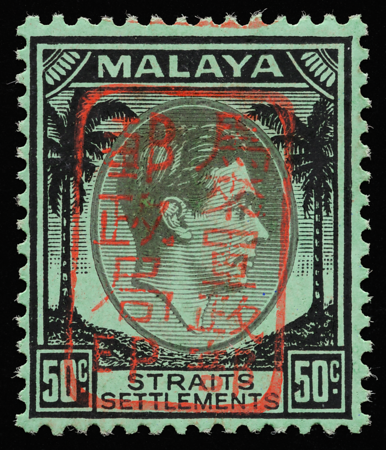 A fellow philatelist has related to the author a story about Milo Rowell, the universally recognized connoisseur of Malaya Japanese occupation overprints: Rowell once dismissed a stamp as having a fake overprint when it had in fact come directly from the post office. To guard against misidentification, one has to cultivate an uncorrupted sense of the look and feel of the genuine overprint through the examination of a large number of verified examples—a diminishing prospect in a market increasingly polluted by forgeries.